Please refer to our stock # 1793 when inquiring. 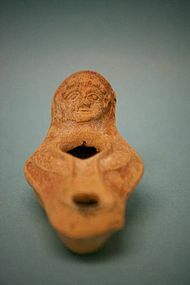 Roman Pottery Oil Lamp with Figure for Handle, ca. 4th Century CE. Handle highly sculpted with human head. Sculpture of head continues on back of handle. A trellis of vines surrounding the fill hole. Nozzle slightly blackened from soot. This highly unusual oil lamp is in excellent condition. 4 1/2" in length.